Rosewood high-gloss piano finish clock with aluminum accents. Stylish with a little art-deco flare at a great price point. 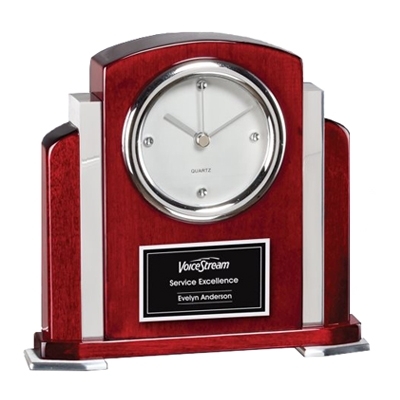 This clock makes a great gift for a deserving employee or a special client or graduate! Your custom message and/or logo is laser engraved on a black and silver plate on the front. Max etch area is 3" (W) x 2" (H). Each clock is individually gift boxed.